A medical technician provides vivid explanations of blood morphology. 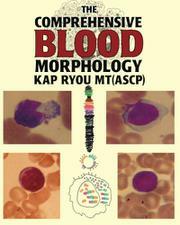 Ryou tackles a complicated subject in his first book, aiming to demonstrate and explain the amazing variety in blood morphology, or the systems and structures that can exist in human blood cells. Analyzing blood cells is useful for clinically diagnosing a wide range of diseases. The book offers a comprehensive introduction to basic cellular ultrastructure (which can be observed using electron microscopes) and then dives into the many potential variations of the blood cell, using a combination of images and careful descriptions. It also includes depictions of various blood disorders as well as an in-depth exploration of the structure of stem cells. Ryou’s firsthand experience with these blood-cell variations is apparent throughout. However, the quality of the book’s images varies widely; some are fascinating, full-color, high-resolution photographs, but others are simple sketches, apparently done using Magic Markers. Although the handmade drawings are instructive, they’re also indicative of the book’s largest problem: Its intended audience appears to be laypeople. The book is full of simple explanations and historical details, but nonprofessionals may not be interested in a fairly dense work about cell structures. Medical professionals, meanwhile, likely won’t put up with the book’s typographical errors, inconsistent graphics and simple surveys, and other texts may be more helpful as instructional tools or quick-reference works. The author’s commitment to his subject is admirable and his passion is clear, but this book may have extremely limited utility for most readers. With some edits and a shift in focus, it might have been a valuable book for diagnostic professionals; as it is, however, it may prove frustrating to readers who are genuinely interested in its subject. A detailed look at blood morphology that may have difficulty finding an audience.